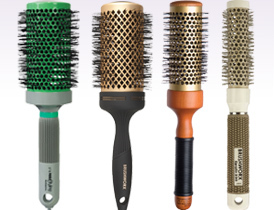 Hot tube hair brushes, or thermal brushes, feature a hollow barrel for hair air to circulate when blowdrying, ensuring hair is set in place for longer. Hot tube brushes have a metal or heat conductive material as the centre of the brush, this gets hot using the heat from your hair dryer working not only on the surface of the hair, but internally as well. You can achieve long lasting results that are much like setting your hair on hot rollers!